The Pink Ledges trail is located in the Red Canyon area of the Dixie National Forest near Panguitch, Utah. Over 1 million people pass through the Red Canyon each year in route to Bryce Canyon National Park. Travelers can't help but to stop and take in the stunning beauty of the hoodoos and spires making it one of the most photographed places around. The bright colors of the hillsides in contrast with the different hues of green from the towering ponderosa pines and other plants paints a picture as pleasing as nature can conjure anywhere else on the planet. 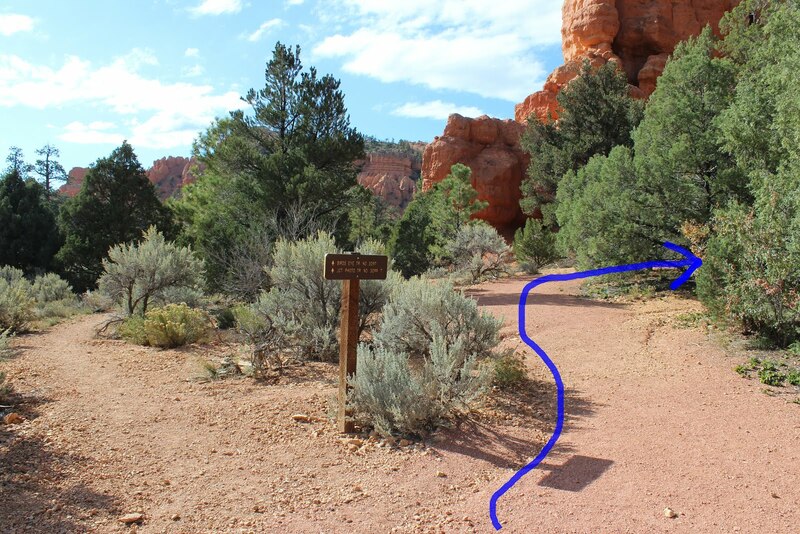 The Red Canyon Visitor Center is the trailhead but to find the actual trail you will need to follow the path on the west side of the building. The Pink Ledges trail is an interpretive nature trail with numbered posts along the way that point out interesting facts. You can pick up a trail guide in the Visitor Center that will give you the information for each location. If you would like to hike in the direction of the numbers then head west and follow the loop clockwise. There are 3 or so other trails that can also be accessed from the Visitor Center and the trail signs can get a little confusing. There are actually 2 places where you can take the right fork and find the beginning of the Pink Ledges trail. You will know you are on the right path when you come to the first numbered post. There is something inviting about walking among these uniquely weathered cliffs. The trail does have over 100 feet of elevation gain but the slopes are pretty gentle for the most part. Some places along the trail look very familiar like a scene from an old western movie. Have you ever put your nose up to a ponderosa pine and taken a good whiff? One of the markers mentions that you will likely smell a blend of butterscotch and vanilla. There is an old historic cabin at the east end of the trail where the ranger once stayed. The outside of the building has been resided and roofed using modern materials but the inside is as rustic as ever. It is always amazing to imagine living in a house without any insulation where the cold winter wind would pierce through the cracks in the walls. Reminds me of a winter that was so cold that we all had to stand around the stove so the heat would thaw our words out so we could hear each other. The Red Canyon area of the Dixie National Forest, besides being a spot that everyone drives through when heading to Bryce Canyon, is also a good destination. Along with the Visitor Center there is a campground and trails for hiking, horseback riding, biking and ATVs. If you would like to see it for yourself then all you have to do is 'Take a hike'.